Gave us a site obviously not for a tent. Not really fit for a camper either. 4 inches of standing water, electrical connection in the middle of it. Sewer manhole in the middle of the site. Of course there is a no refund policy, they make you pay ahead so they can give you a small useless campsite. Customer service is awful. If you are in this area, just find another campground or go to a hotel for the night. I don't see how this camp ground received a rating of 9. The restrooms and grounds are more like 7. There's a very tight turn-around that one must use after registering that's not friendly to long motorhomes. Ours is 39 feet and we tow a car. We could not make the turn, so had to stop and disconnect the car, back up the motorhome slightly, then proceed. I wasn't planning to disconnect the car as we were leaving right away the next morning. Our turn around is a bit tight but is easily navigated daily by few big rvs, semi deliveries and our national acts that come for our on site music venue. They typically arrive in Prevost buses with cargo trailers. Our restrooms and office have been remodeled as of late 2018 early 2019. The mens room and laundry were just done. The grounds take a beating from the pu kic over 49 years but we fix and repair things daily to keep everything as nice as possible. This was a small but campground. We were assigned a pull-through in the front designated for short time campers, which like one of the other reviewers mentioned. Like lots of other campgrounds, it seemed like most of the sites were long term campers. The staff was friendly. Thank goodness we only stayed one night. Very unfriendly service. Sites in the front are for short term. Long term renters are in the rear of the park. Narrow roads to maneuver. No one there to help you, they give you a map and you locate your site yourself. There are a few pull throughs and the rest are short, narrow backins These are hard to get into due to the narrow roads. No way could a big rig fit into any of the back ins. The sites are narrow grave. We stepped out into mud. The 50amp service was good but the cable was poor. There wasn’t any WiFi. $35 for electric & water only seemed high with No sewer connections. The grass wasn’t mowed and an old table was placed on a slope & wasn’t useable. We won’t be back. As we celebrate our 49th year in operation we realize our roads built in 1970 are a little narrow compared to today's size rigs. We have 40ft plus campers in every section so all roads are more than doable. We have back in from 40 ft to 72 ft long and have big rigs on them nightly and there are zero issues. We DO have wifi but we do not have high speed so due to other campers abusing the bandwidth you may not have bee. able to connect I am sorry. All of the tables in our overnight section are heavy commercial galvanized frames and none are old or in disrepair. They are checked and repainted every year. Could tell this was once a good place to stay. Rest rooms old, (over rated), difficult to see how well cleaned due to age and condition. Cable TV had not one clear, usable channel; even tried connecting to adjacent site. WiFi is weak and just usable. Works for an over-night stay. Thank you for your feedback. The ladies room is slated to be remodeled this fall, in just the next few months. It was redone in the last 5 but the flooring has discolored badly and is being redone again. This takes away alot from the appearance of the room. The bathrooms I assure you are clean, they are cleaned daily noon to 1 and spot checked after. Our cable works at all of our overnight spaces unless an end is bad or a booster is unplugged. If you tried multiple sites it is possible your power antenna booster was on and cancelled out the cable signal. This is a common issue in many parks and often overlooked by rv'ers. We will check out cable as we do each week to make sure that it is still operational. We hope to add more channels as they become available to us from our provider. The same with wifi, our local provider only has 5 mb lines for us in our rural area. This if you know about wifi is not much for bandwidth and is easily taken over by streaming video or games. We have 5 lines running into the park to try to keep up but with todays devices it is a hard battle. Happy camping and safe travels. tent site near nasty brook with old mattress thrown in it. they use out houses except in store building. Couldn't sleep with planes flying over all night, trains and trucks on interstate. A lot of the campers I believe live there with metal sheets making a storage shed. Saw cars on blocks,etc. Will never stay there again. Felt very nervous. If a guest threw a mattress into the creek bed I can assure you it was there for just a short time until we removed it. We walk the park daily to pick up trash due to people not seeing our over 50 garbage cans placed around each camping circle. We are over a half a mile from I-75 so no interstate noise can be heard whatsoever, and a faint train whistle is possible but they are over 1 mile away. We do have a porta potty in the back of the park for our primitive tent areas to use at night. It is far from an out house, it has a motion light and is checked or cleaned daily. Our seasonal campers do have sheds for storage as they are here longer and have to cut their grass and store other items, none made from metal sheets. If anyone had a car on blocks it was to make a quick repair as we do not allow that type of thing in the park long term. Needs serious updating. Dirty bathrooms that also do not meet ADA requirements. Men's room is bad, not sure about ladies room. Rude staff that doesn't seem to care about anything more than beer and bad local music. Good Sam rating is way off! Our bathrooms are cleaned daily and checked hourly. If you found them dirty we hope that you notified the office as we would have quickly handled the issue. The bathrooms were built in 1970 and have been updated as needed over the years, our womens is slated to be redone in 2017/2018 and the mens in late 2018. We take great pride in our park and our music venue. Hosting great local bands, most bringing in over 150 people from outside the park at times, I doubt their music is that bad. We also host national country acts and host at least 1000 people per event. Dirty bathrooms, very few tent spots. Camp in mud/dirt along creek or above office on a slope. All for the low price of $30!!! Crazy for what you get. Wifi does not work unless you are in the gravelled rv area in the front. Was there for work and had to go to the local McDonald's to use the internet. False advertising! Our primitive tent spots are 20 or 15 a night, some are along our creek or above our office. It is impossible to have grass grow in areas that tents always camp due to the tents killing the grass. Part of roughing it is dealing with the elements. Our wifi works in most areas of the park, it is however hindered by the amount of shade trees we have. We advertise limited wifi, which is exactly what we offer. I had a beautiful site, right on a small creek or stream. Everyone was friendly and all hook ups were easily accessible. The road to the campsite is extremely narrow, and pulling out onto the main road, for larger Riggs, it's tricky. The restroom, is very dated, and not ADA; I could not physically use them. I did use the shower, but again, The restroom/shower facility is dated. The sites are very picturesque along the river, if they update their restrooms, I would come back. 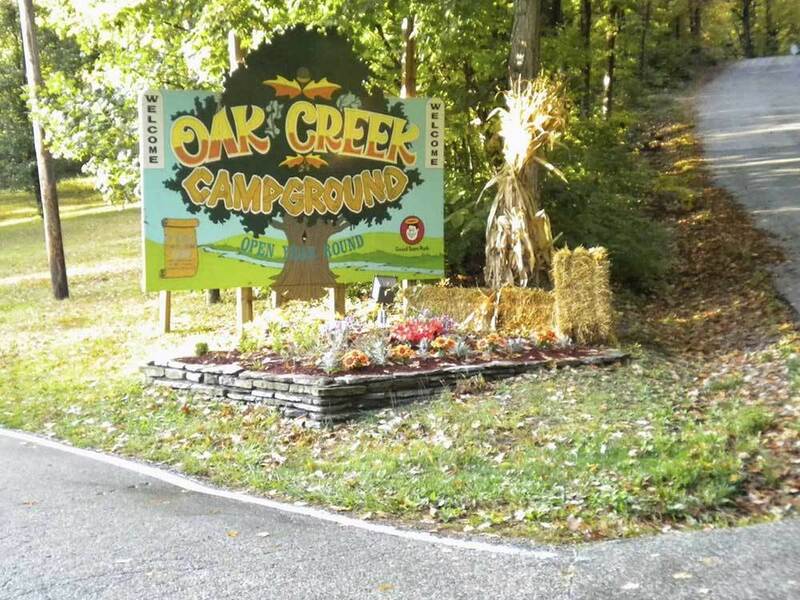 we stayed in this campground while visiting the Creation Museum and the Noah's Ark experience. WE found the staff to be very helpful and friendly. The restrooms while dated were clean and comfortable to use. Campground setting was nice except for the highway just across the creek. Even though they don't have sewer hookups the campground will come to your site and pump your waste so yo don't have to hookup and move to the dump station. Stayed 6 nights while visiting the ark encounter and creation museum. Very easy access to I-75. Water and electric hookups. Our site was on the small creek. Good playground for kids. Lot's of new neighbors from I-75 every night. We did not go into the bath house. We enjoyed our stay and would not hesitate to return if in the area. Stayed overnight on the way home. Would not stay here long term, overnight is all I would visit. Facilities are old and need updating. Mostly seasonal campers. The Good Sam Ratings are inaccurate. Easy-in, easy-out, close to I-75. Only stayed one night, late arrival was not a problem. Pull-thru site was level, hook-ups convenient, but no sewer at site. Did not use any of the facilities, so we can't comment on those. Campsite had no firepit or grill. WiFi did not work. Bathrooms need repaired. We actually left the campsite every time we had to go to the bathroom. Staff was extremely rude. We will never stay here again. Pool had frogs in it. Seem to care more about the music they have on the weekends instead of the way their campground looks. Select campsites have grills, you can request one when making a reservation. All sites with the exception of our pull thrus have fire pits, the pull thru spaces share a community pit 30' away. Our showers and restrooms are cleaned daily and checked hourly. Things do get dirty and we clean as fast as possible. If things where not clean when you used them we hope that you notified the office as we would have quickly cleaned any messes. Our pool is outside, so frogs can get in it. Happens at all outside pools, we remove them when we see them or asked. Overnight is all I would stay and only because it was right off the highway. Most sites are seasonal that have been around a long time. Old and tired rv's. Many sites have old sheds and debri. No sewers hook ups available at any sites. Many narrow roads with turn around loops on the end...only pull thru's would work for large rigs.